Full bodied and earthy with sweet perfume of crushed rocks, blueberries, crème de cassis, creosote, vanilla, and spice. Dark purple hue. The Heinrich was harvested by hand. The Shiraz, Mataro and Grenache are separately crushed, fermented and aged until final blending and bottling. Vilification occurs in open fermenters with pump overs twice daily. The fermentations was completed in tank, the wines were then racked at barrel. Oak used for the Shiraz was 15% new oak, 45% shaven American and 40% two year old American. For the Grenache, 50% shaven French, 30% shaven American and 20% two year old French. The Mataro was aged in 50% shaven French and 50% shaven American oak. The wine was blended to style, utilising the strength of the Shiraz, the fruit of the Grenache and the fine tannin of Mataro. 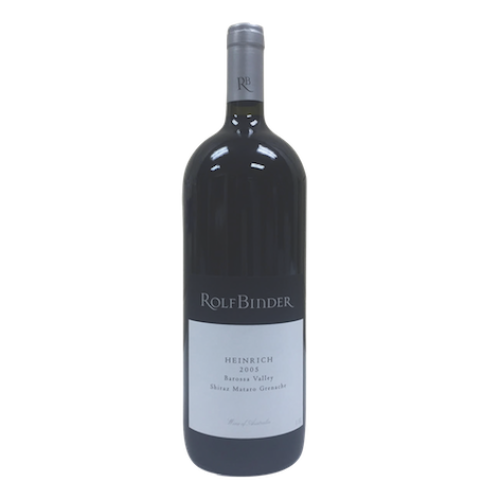 "The 2005 Heinrich, a blend of Grenache, Mourvèdre and Shiraz(15%, 30% and 55% respectively) reveals a dark purple hue along a sweet perfume of crushed rocks, blueberries, crème de cassis, creosote, vanilla, and spice. It is a full, earthy effort".